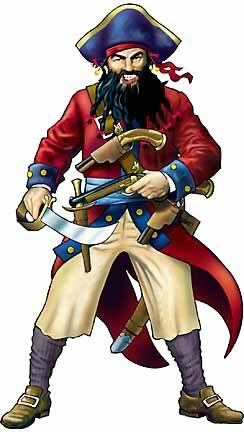 The name of Tampa's Gasparilla Pirate Festival comes from the legendary pirate Jose Gaspar, "last of the Buccaneers," who terrorized the coastal waters of West Florida during the late 18th and early 19th century. Gaspar, given to calling himself "Gasparilla," served as a lieutenant in the Royal Spanish Navy for five years until 1783 when, upon seizing command of a Spanish sloop-of-war, he with his fellow mutineers set sail for the Florida straits. And so the young Spanish aristocrat-turned-pirate began an adventurous life as an outlaw of the sea. Although few facts are known of the life and death of the famed Gasparilla, accounts from his own personal diary boast the capture and burning of 36 ships during his first 12 years as a pirate. Crews of captured ships were given the option of joining Gaspar's ranks or walking the plank, fates of captive ladies were determined largely by his moment's fancy. The number of ships that fell prey to Gasparilla and his buccaneers during later years is not known, but he continued to ravage Florida waters until December 1821. Deciding it was time to retire from pirate life, Gaspar had just convinced his crew to split up their accumulated fortune, disband and live out their lives in peace and luxury. But the sight of a merchant ship sailing northwestwardly toward New Orleans was all too inviting for the greedy adventure-seekers. One last thrill, and they would end their careers in grand style – Gaspar and company could not resist, and so set out to pillage the seemingly unassuming merchantman. Closing in on their prey, the pirates realized, to their chagrin, they had chosen a United States Navy warship in disguise for their final folly. And final it was. A bloody battle ensued, leaving Gasparilla's flagship burning to ruin. As the story goes, just as the commanding officer of the U.S.S. Enterprise was boarding the defeated ship, Gasparilla seized a heavy chain, wrapped it around his waist and neck and leaped into the water, brandishing his sword in a final gesture of defiance as he sank into the sea. Gasparilla...the man. Judging from this scant bit of history, it is clear that Jose Gaspar was well suited to his chosen occupation as pirate. Tales of his triumphs at sea prove he was certainly bloodthirsty, greedy and adventurous enough; as pirate, he fit the bill. But aside from the fact he possessed a fierce nature with some rather contemptible traits, what else is known about the character of this legendary man? As an aristocrat by birth and officer in the Spanish Navy, Gasparilla was well educated, possessed courtly manners and had all the appearances of a fine gentleman. He was a faithful friend and expressed kindness to those he held dear. The mighty Gaspar, it is said, had a soft side, which he demonstrated on more than one known occasion. Once, when close friend and comrade-in-crime Roderigo Lopez expressed a sincere desire to leave the outlaw life and return to Spain, Gasparilla not only gave his consent, but extended his blessing, supplied a boat, and sent a number of men along to help his beloved First Mate on the long journey home. In another instance, Gasparilla discovered the Captain of a captured ship to be a former classmate, inmate and friend from the Spanish Naval Academy. The Pirate leader was so thrilled to see Captain Menendez, he took him back to headquarters despite threats from the Captain of escaping and bringing an end to the pirate's exploits. Gasparilla did not try to force Menendez to become a pirate, but held him as a friend and confidante, showing him every courtesy and consideration. Eventually Menendez died saving his captor-companion's life by intercepting a disgruntled crew member about to attack the sleeping Gasparilla. Perhaps the best example of Gasparilla's more human side comes from the story of his love for Ann Jeffrey, a beautiful English woman captured while on her way to visit her sister in Louisiana. Gasparilla fell desperately in love with the young maiden and was intent on marrying her. But when the lovesick Gaspar proposed, Ann would not accept his offer confessing fearfully that she was in love with Batista, another one of his pirates. Despite his certain instinct to have the lovers put to death in some cruel manner, Gasparilla seized a merchant ship and agreed to set her free unharmed, cargo and crew intact, on the condition that Ann and Batista be married on board and carried safely back to England. When Jose Gaspar died, he supposedly left an untold fortune in buried treasure somewhere along the Florida coast. Though that treasure has never been discovered, the story of the swashbuckling Gasparilla was unearthed and his memory revived in 1904 when Tampa's social and civic leaders adopted the pirate as patron rogue of their city-wide celebration.